“This is another stunning restoration of historic material by Richard Caniell and Immortal Performances....He has worked on it over many years. 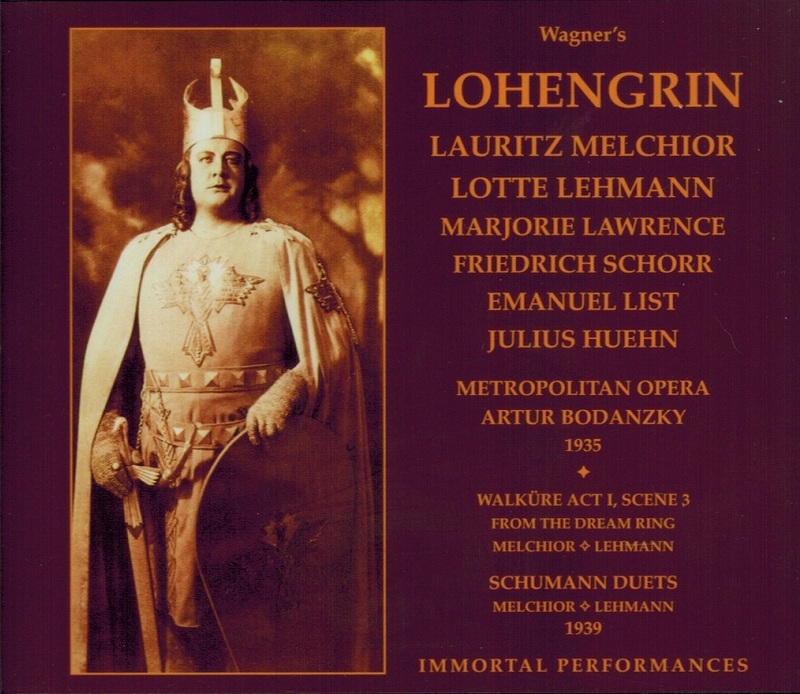 Lehmann's voice is positively thrilling throughout...a performance of nobility and humanity...conveyed here in a wholly convincing manner, and with unfailingly glorious tone production and phrasing. Marjorie Lawrence is a splendid Ortrud....Schorr's voice shows a few signs of wear ...but the flaws are minor when compared with the depth of his characterization and deep musicality of his singing, and the variety of inflection and color he brings to Telramund....Assessing Melchior's performance, this is the very best of those that have survived. A direct comparison of this (set) with the Myto and the Melodram releases of the same performance demonstrate the superiority of the Immortal Performances release....The set also includes Milton Cross’ commentary and curtain calls. 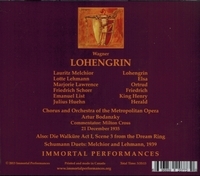 “This 1935 broadcast of Lohengrin, with its fascinating cast of Lauritz Melchior, Lotte Lehmann, Marjorie Lawrence, and Friedrich Schorr, under the splendid Metropolitan Opera conductor Artur Bodanzky, has an emotional vitality — a depth and complexity of feeling — unequaled in my long experience of the opera. Each of these singers, indeed, brings to this live performance a musical and dramatic spontaneity almost extinct in our own age, and rare even in its own time. In sound and style, none of these performers could be mistaken for anyone else, and each suggests a character of truly Wagnerian profundity. Friedrich Schorr has been regarded by his audiences and most critics from that time to our own as the greatest Hans Sachs and Wotan in memory….These elements of Schorr’s Telramund — the nascent nobility, the need for power and love — give Marjorie Lawrence’s Ortrud much against which to play….Lawrence was 26 at the time of her Met début (as the WALKÜRE Brünnhilde), and three days later as Ortrud she sounds strong, youthful, and driven by ambition, with a powerful and handsome dramatic soprano voice, dependable technique, and a forthright temperament….Lawrence’s soprano offers a young, capable Ortrud driven to damnation by the morality of the ancient gods of her childhood and by blind ambition. 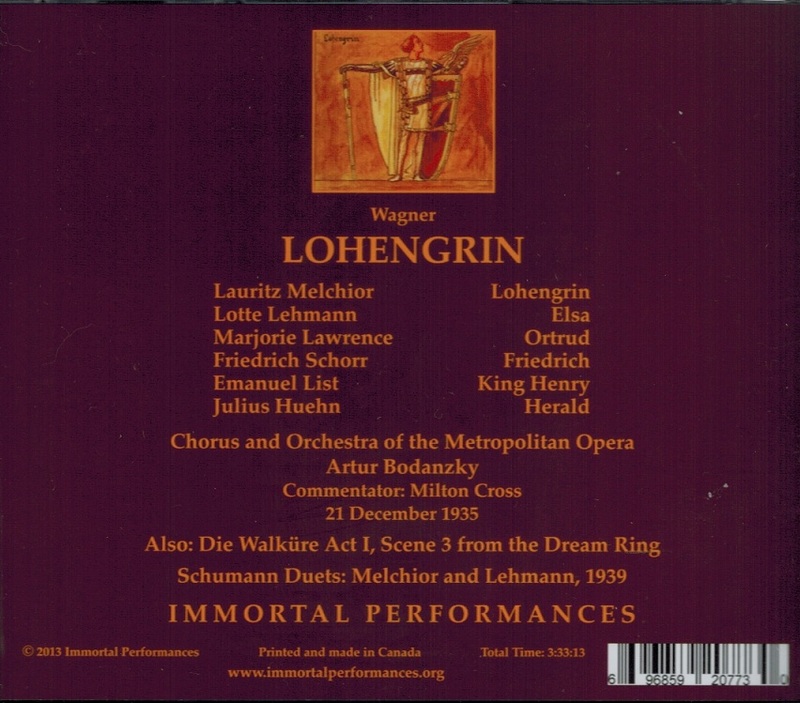 [The] directness, subtlety, and variety of effect characterized every role that Lehmann touched, from her Manon to her Turandot, as well as her Sieglinde and Marschallin, and virtually all of the songs of which even then she was becoming an unforgettable performer. In LOHENGRIN, we are led by this soprano’s inimitable tone of wonder, as well as by Wagner’s orchestra, into a visionary state ourselves. No other Elsa, except perhaps Rethberg, drives us into this experience in quite that way….Lotte Lehmann alone gives us a complete Elsa: a young noblewoman filled with the sensuous as well as the philosophical longing that Wagner gives us in his wondrous score. Each of her phrases in this live performance, one might add, is at once both public and private in effect: intimate and yet at the same time so intense, so true as to rouse individually the members of an entire audience. No other tenor voice in my experience fulfills Elsa’s vision as fully as Melchior’s….Melchior gives us the noble voice and the effortless intimacy of tone that among heroic tenors are his alone. Together, Lehmann and Melchior have, in addition, a kind of authority in delivery that, of itself, places their characters on a different spiritual level than those around them….A generosity of spirit joins them from their first moment onward, so that when the final moments of the opera come, the conflict between the earthly and the divine seems both irresistibly touching as well as tragic for both of them. As Lehmann plays her here, Elsa in her excitement can hardly get the words out, and yet Lehmann does not rush ahead with the tempo but gets a breathless quality into her tone, all the while maintaining what might be described as a ‘Lehmann legato’….Her voice remains fresh: both the character and the singer seem to have undergone a kind of rebirth. Sixty years after his departure from the Met, [Melchior] remains vocally the standard by which other Wagnerian tenors are judged. Melchior had, with his insuperable technique, a magnificent range of tonal colors, remarkable musicality, and, like Lehmann, the capacity to recall another world with his voice alone….Though he had a huge voice of encompassing warmth, some of his greatest moments were the quiet ones. His phrasing was musical and dramatically expressive at all times: for proof hear all of this performance. You will hear not a note of strain, not a breathless phrase, not a tone color that contradicts the sentiment expressed. More than seven decades after this performance he remains, like Lehmann, unsurpassed and irreplaceable.